The durability of reinforced and prestressed concrete is severely affected by the ingress of chlorides. Chlorides are transported through the cover concrete in the form of water-borne salts and ions. Penetration of chlorides in solution form is possible only if the concrete is dry. In reality concrete is in a state of saturation, with the near surface concrete at a lower degree than that inside a structural member. Therefore, the primary mode of transport of chlorides (and in fact most ions) is diffusion. The resistance of concrete to ionic transport can be determined by extracting cores and testing them in a laboratory. However, this is very cumbersome and introduces damage to the structure. The PERMIT Ion Migration Test allows tests to be carried out in situ. •	Compliance testing for chloride diffusion coefficient. The duration of PERMIT Ion Migration test depends on the quality of the material under test. Normally the test lasts for 1.5 hours to 10 hours. •	CHLORIDE DIFFUSIVITY	Related to chloride induced corrosion and hence can be used in service life models where corrosion is caused by chlorides. 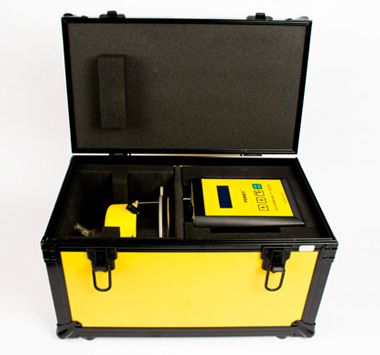 The PERMIT Ion Migration Test is a unique instrument that is capable of measuring the ion penetration resistance of concrete and other building materials both in laboratory and on site. Using this equipment, ions are forced to move through the near surface by applying a potential difference between two chambers containing an ion source solution and a neutral solution (Fig. 1). The rate of ions arriving in the neutral solution is monitored using electrical conductivity measurements and when a steady state has been found the flux is determined by analysing samples taken from the outer chamber. By utilising this steady flux and employing Nernst-Planck equation, the ionic diffusivity (or the coefficient of ion diffusion) is calculated. The PERMIT is supplied in a portable carrying case, and consists of two parts, the PERMIT body and its electronic controller and data recording system (Fig. 2a). Figures 2b and 2c show two methods of mounting the PERMIT body on test surfaces. As can be seen in these figures, the PERMIT can be applied to both horizontal and vertical surfaces. 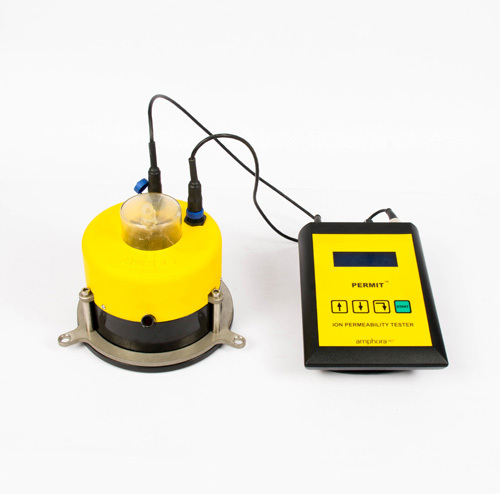 •	an electronically controlled system to apply the test voltage, stir the solution and measure conductivity and temperature of the outer chamber. •	two reservoirs; one to hold sufficient quantities of the ion source solution and the other to hold a neutral solution, such as deionised water. •	a circular electrode in the inner chamber (cathode) and an annular electrode in the outer chamber (anode) of suitable materials. •	a clamping ring to fix the body of the apparatus onto test surfaces, either by bolting or using clamps. 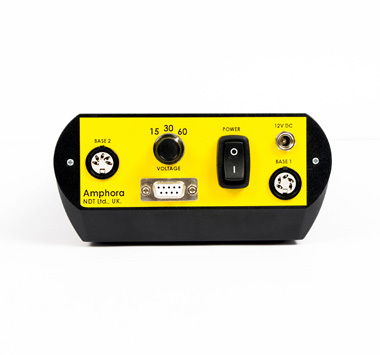 The electronic control boxcontains all the custom designed electronic control and recording hardware. On its top panel (Fig. 2a) is a back-lit digital liquid crystal display screen and test selection keys. There are two sockets at the back of the control box, one of which is used to connect the PERMIT body to the control box and the other is used to connect the control box to a PC. Also supplied with the kit is a DC power supply unit. During the progress of the test and at its completion, the data can be transferred to a PC for further analysis. PERMIT can be used to assess the resistance of building materials to the transport of ionic species, such as chlorides, sulphates, etc., which are considered detrimental to the long-term performance of construction materials. The current procedure to determine this property of a building material is to test, in the laboratory, cores removed from structures. The test itself may last for three to seven days, depending on the quality of the material. The PERMIT requires only a test duration of less than 10 hours and is the only instrument available at present to measure on site the resistance of building materials to ionic transport. 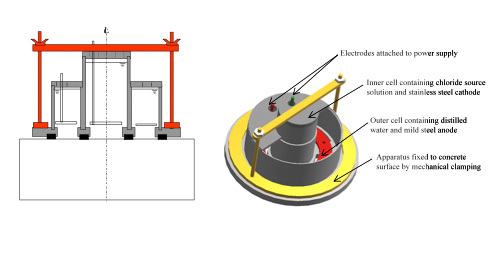 In this test the test surface is saturated prior to fixing the instrument, to ensure that the flow of ions due to the applied field is through saturated capillaries. Steady state conditions are achieved within 6 hours, depending on the type and quality of material tested, and the rate of steady outflow of ions through the near-surface zone of the material is used to calculate the coefficient of ionic migration (diffusion), as defined in Nerst-Planck relationship. 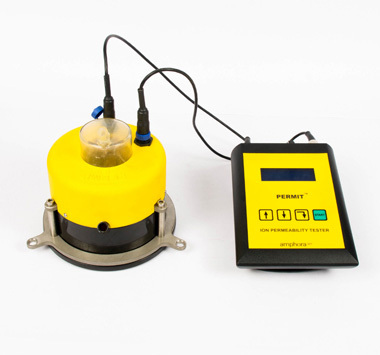 The PERMIT has been developed by Amphora NDT Ltd in partnership with Queen’s University Belfast and remains the world’s only site ready chloride ion migration test. The ingress of chlorides into concrete is predominantly by the mechanism of diffusion and the resistance of concrete to the transport of chlorides is generally represented by its coefficient of diffusion. The determination of this coefficient normally requires long test duration (many months). Therefore, rapid test methods based on the electrical migration of ions have widely been used. 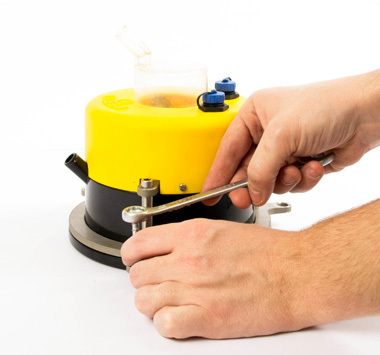 The current procedure of chloride ion migration tests involves placing a concrete disc between an ion source solution and a neutral solution and accelerating the transport of ions from the source solution to the neutral solution by the application of a potential difference across the concrete disc. This means that, in order to determine the chloride transport resistance of concrete cover, cores should be extracted from the structure and tested in laboratories. 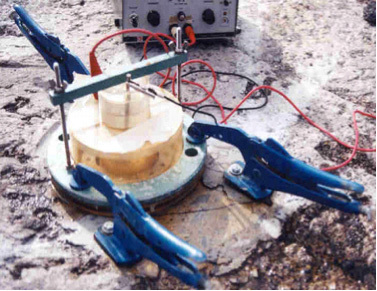 In an attempt to facilitate testing of the concrete cover on site, an in situ ion migration test (hereafter referred to as PERMIT ion migration test for the unique identification of the new test) was developed. The PERMIT ion migration test was validated in the lab by carrying out a comparative investigation and correlating the results with the migration coefficient from the one-dimensional chloride migration test, the effective diffusion coefficient from the normal diffusion test and the apparent diffusion coefficient determined from chloride profiles. A range of concrete mixes made with ordinary Portland cement was used for this purpose. In addition, the effects of preferential flow of ions close to the concrete surface and the proximity of reinforcement within the test area on the in situ migration coefficients were investigated. It was observed that the in situ migration index, found in one working day, correlated well with the chloride diffusion coefficients from other tests. The quality of the surface layer of the cover concrete and the location of the reinforcement within the test area were found to affect the flow of ions through the concrete during the test. Based on the data, a procedure to carry out the PERMIT ion migration test was standardised. 3.1	Why assess the properties of near-surface concrete? This paper reports the developments on Permit Ion Migration Test (PERMIT), which is a unique non-destructive test method developed at Queen’s University Belfast for assessing the rate of chloride ion transport through concrete on site. Results from PERMIT correlated well with those of the conventionally used and pre-European standard test methods. This means that, the rate of chloride ingress can be assessed on site with PERMIT without removing cores from the structure. The test duration is much shorter compared to the lab based tests and as PERMIT is completely automated, test can run independently and does not require a skilled person to operate. The test set-up of PERMIT is very similar to that of the ASTM C1202. Therefore, the developments made on the former are also applicable to the latter. This similarity has been utilised here to review the test procedure for ASTM C1202. Findings reported in this paper demonstrate how modifications could be made to the current ASTM method for determining the chloride transport resistance of concrete. It is widely recognised that durability of concrete depends on its transport properties, viz. absorption, diffusion and permeability. As concrete cover provides the first line of defence against the ingress of many deleterious substances into the concrete, a measure of its transport properties is vital in assessing its long term performance in the given exposure condition. In new structures the rate of ingress of the deleterious substances could be monitored using array of electrical sensors which are embedded in the cover concrete. For structures which are currently in service, two in situ permeability apparatuses, viz. Autoclam Permeability System (for measuring gas/water permeability and water absorption) and Permit Ion Migration Test (for determining the ionic diffusion) could be employed. These instruments can be mounted on the concrete surface for carrying out the tests. Typical results are presented for these two novel testing systems to illustrate their usefulness for the condition assessment of reinforced concrete structures. An extensive chloride profiling program was undertaken on concrete pier stems erected in the vicinity of the Dornoch Bridge located at the Dornoch Firth in Northeast Scotland. The pier stems were 2 m (6.562 ft) high and octagonal in plan with 0.66 m (2.165 ft) wide faces. The piers were constructed in sets of three with the lowest of each set in the tidal zone and the highest in the atmospheric zone. The pier stems were placed in such a way that they would represent the exposure conditions of the actual bridge piers of the Dornoch Bridge. In all, six of the pier stems were made using plain ordinary portland cement (OPC) concrete (with three of these having the surface treated with silane); the remaining three pier stems had a concrete containing caltite as an additive. Three exposurezones were studied: the tidal zone, the splash zone, and the atmospheric zone. The tidal zone was further subdivided into two levels defined as low-level and high-level. Chloride profiles were obtained from the different regimes over a period of 7 years for all nine pier stems. This paper describes the nature of chloride ingress and the usefulness of diffusion parameters in classifying each exposure regimes. Furthermore, the effectiveness of silane and caltite in protecting concrete from chloride ingress in different exposure zones was studied.